“You are never too old to play campfire games” I announced to the group! Several faces looked up from their fire making activities with eyebrows raised. Without wishing to make too fine a point, the average age of our group is 70 but suggest for a minute that any of these fine ladies are too old for anything and you are quite literally “playing with fire”! As their decades of camping experience proved they were surely experts at both creating fire making materials, and crafting a fire and they certainly showed me a thing or two. The challenge was to light a fire in a barrel to burn through the string tied over the barrel opening to be the first group to win! One team, fire lit, lifted up their fire!! This Treachery was rewarded by making them start again! Apparently you are never too old to cheat! When all wood was shaved, all fires made and all feuds resolved, symbolically the three fires became one and together we made ‘dampers’. This was a chance for all to show their creativity more than anything else as dough of all shapes sizes and consistency’s was wrapped round, over and just plain lanced on sticks, and toasted over the campfire. We sat in the woods where girl guides have been coming all summer, round the Our Chalet campfire and enjoyed our spoils, some of which were a considerably darker shade than others! 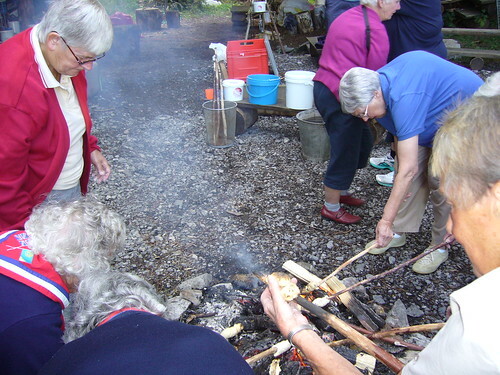 Later on in the evening the camp fire was to feature again – this time inside the chalet! We held a good old sing song round the old fireplace in the dining hall and enjoyed some old guiding classics as well as some slightly newer songs. The real test of the evening was the accompanying actions. It turns out that it is in fact physically impossible for me to hold my nose with my right hand and right ear with my left hand alternately! The photos of me trying though are fairly amusing!